Besides apathy, the No. 1 killer of most rock bands is the solo project. Maintaining a sense of direction is a core challenge for any group and nothing can undermine a band’s commitment to a common musical vision as when someone won’t drink the Kool-Aid and strikes out on his or her own. It sends a clear signal that this person believes the expansive individual supersedes the restrictive collective. And for many, they’re siren calls luring unsuspecting musicians off the path. Metallica, which has a legendary antipathy towards musicians with outside ventures, find them so dangerous that James Hetfield and Lars Ulrich ban their bandmates from them all together, a policy that forced bassist Jason Newsted to jump ship. Loyalty is a persistent question mark for Canadian indie-rock group Wolf Parade. While the Montreal-based quartet has only one album and an EP under its name, the band members have no qualms about juggling a handful of ongoing side projects as they attempt to solidify their hold on the Pitchfork nation. Add to this the fact that the band’s material is evenly divided between two singer-songwriters and it appears like Wolf Parade is only a confederacy of New-Wave-worshipping allies rather than a band of brothers. So who’s to blame if we find the group’s name utterly appropriate; this is a pack of musical lone wolves. Although their wolfish tendencies are still apparent, Wolf Parade’s brand-new album, “At Mount Zoomer,” is an intriguing listen chiefly for how skillfully the group sidesteps these issues. Band has found a way to incorporate individuals’ tastes into the greater whole and create a stronger band sound in the process. Until now, the group has been the beneficiary of overly generous buzz. Their debut, “Apologies To The Queen Mary,” piqued interest in the band among underground-rock specialists south of the border who were looking for another act to compliment fellow Quebecers Arcade Fire. Wolf Parade, however, is a much different kind of combo. The group lacks the grandiose, symphonic melodrama of its musical comrades and its recorded output thus far has been more conventionally structured and stubbornly experimental. Their music — at its best — takes the early ’80s and gives it a smarter, guitar-oriented edge. The songs pull in Soft Cell synthesizers, thin, angular guitars runs and emotionless, Beck-ian vocal intoning that perfectly compliments the current return of ’80s fashions and emboldens those who believe in music’s retro future. Perhaps of equal concern as the group’s internal divisiveness is how Wolf Parade’s first record featured only two breakaway tracks. In total, “Apologies To The Queen Mary” was too inconsistent to be perceived as an exemplary album. Matters for the band only worsened because in the couple of year since, the members concentrated their energies on those infamous outside activities, further dimming the group’s prospects. “At Mount Zoomer” should stamp down most doubts about the ensemble’s musical unity or the caliber of their new songs. It’s not a Wolf Parade equivalent of Radiohead’s transition from “Pablo Honey” to “The Bends,” but the nine tracks gives greater justification for all those hipper-than-you blog postings and feature articles. The band’s creative focus still rests with its founders, singer-guitarists Dan Boeckner and Spencer Krug. While both lead their own spin-off groups (Handsome Furs and Sunset Rubdown) and continue to trade the front position on “At Mount Zoomer,” it’s not as obvious as before when one is stepping forward and the other is stepping back. The two collaborators’ differing stylistic impulses for the moment seem capable of forging a sonic identity for the band. Boeckner is the stronger composer and his tracks have not only a dynamism that’s mostly absent when he plays sideman, but also a freshness and originality to how he fills out the song’s arrangement. The opening track, “Soldier’s Grin,” starts as an overlapping conversation between a Casio keyboard’s whimpering and percussive, John Frusciante guitar chops before seamlessly transitioning into a futuristic, flamenco-style flourish during the verses. The song’s energy is manic and Boeckner somehow keeps the wheels on the road when he deftly guides his bandmates into a more tranquil bridge. The synthesizers and keyboards that hounded the melody move further back in the mix as Boeckner and Krug’s guitars face off and mimic each other. The breakdown slowly picks up where the main melody left off with each distorted, jousting lick tossed out by the pair. “Language City” has a similar propulsive feel, but this is because of Arlen Thompson’s unwieldy drumming. The melody is a delightful mesh of squished keyboard lines and Theremin sounds and bears many of the musical hallmarks of Boeckner’s keyboard-obsessed side gig in the Handsome Furs. Again, the big difference is Thompson’s drums — the Furs are chained to the monotonous squawk of a drum machine. Having a living body man the kit allows Boeckner to be more adventurous, changing time signatures and shifting moods. His best cut might be “The Grey Estates,” which sprints forward with all the locomotive power the group perfected during the “Queen Mary” era and expands the band’s sonic palette with inquisitive keyboard harmonies. Krug’s songs are moody and obtuse, too, but are more apt to be left-field respites from the New Wave rave. “California Dreamer” takes elements of the Mamas & the Pappas and blends it with the electric-piano frenzy and white-guy funk of Talking Heads’ “Take Me To The River,” but the amalgam’s circular hook just repeats instead of building up energy. Schizophrenic “Bang Your Drum” segues between thrashing guitars and a piano ballad, but never really develops a satisfying melody and drags on and on. Krug does share Boeckner’s fondness for multi-segmented songs, but is sometimes able to come up with something fun. “Call It A Ritual” is four minutes of guitar abuse underpinned by a stilted piano that sneakily develops in intensity as Krug’s holler from the bottom of a well. Krug gives the meandering “An Animal In Your Care” a similar, echo-y vocal treatment, but the song morphs into a more aggressive posture with a thudding guitar lick and a synthesizer tailing close behind and cutting through the warbling. Boeckner and Krug finally share vocal duties on the album’s 10-minute closer, “Kissing The Beehive.” The song is another Beatles-medley of pop ditty/guitar noisefest/keyboard workout than an Arcade Fire pompous symphony. It does demonstrate the band members’ surprising malleability as they ratchet up the musical tension and then downshift into moodier territory and back again. The band was so found of the track that the album was slated to be named “Kissing The Beehive,” but it was changed either because a novel already shares that name, or because of how Pitchfork publicly ridiculed it or perhaps none of the above. 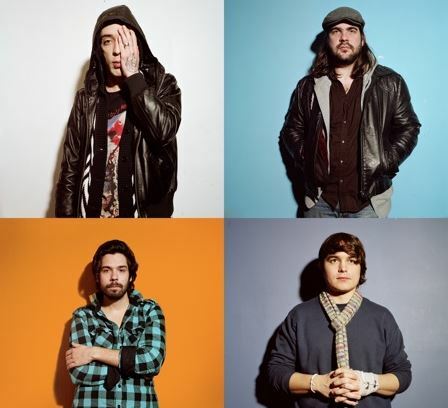 At this point in time, a landmark record would have pushed Wolf Parade onto a higher level. Barring that, “At Mount Zoomer” is the kind of record that Wolf Parade absolutely needed. The record has music that will solidify their audience gains, improves the audio formula and strengthens the perception of them as a band and not some ego-hampered Canuck supergroup (sorry New Pornographers). The band members all might be solo artists at heart, but right now, Wolf Parade is really working as a unit and they shouldn’t be enticed away toward side groups. The record should keep the wolves at bay for now. Monday, July 7, Pontiac, Mich.
Tuesday, July 15, Portland, Ore.
Sunday, July 20, San Diego, Calif.
Monday, July 21, Tucson, Ariz.
Saturday, July 26, Baton Rouge, La. Tuesday, July 29, Carrboro, N.C. Tags: "At Mount Zoomer", Dan Boeckner, Montreal, review, Spencer Krug, Wolf Parade. Bookmark the permalink.